The lambs are nearly as big as the ewes now. Big sturdy boys and girls graze beside their mothers, occasionally toppling them, as they push for the last drops of milk. Soon we will bring them all down from the hill into the yard to be sprayed for fly strike, the curse of these warm, wet summer days. The lambs will go up to Phil to be shorn. Then, once separated, everyone will be moved to pastures new.The ewes will Baa for a little while then settle to a quiet life in the orchard restoring their strength after raising their young. The youngsters will learn the independent life. Big Fred will stay with us for one more year. 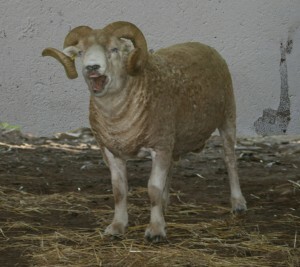 He has produced some very promising ram lambs with really good conformation, fine future tupps, we hope. They will mature through the winter and go to next year’s Annual Whiteface Show and Sale in Exeter. Young Gilbert, born last year, has also turned into a sturdy chap and will go to this year’s sale. He is too closely related to last year’s yearlings; his sisters and cousins. 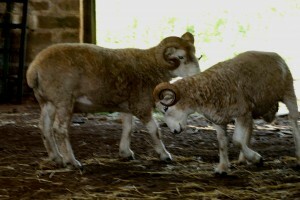 They will join the breeding stock in the autumn replacing the old cull ewes too old to lamb again. Thus the flock and the bloodline are replenished and the cycle continues. Larry, the old pet Wether, is still with us, a useful summer companion to the rams. 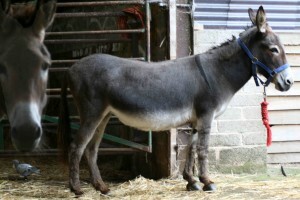 At present he is with Fred and Gilbert and the donkeys. 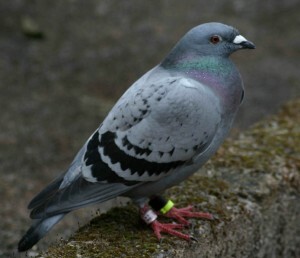 They have a surprise new companion, Claude, Paul calls him, a lost racing pigeon who potters around happily amongst them all; a funny little group! 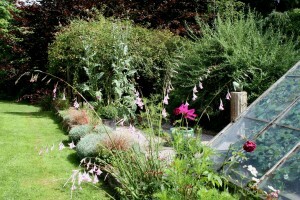 As soft rain and warm days turn the garden into a wonderful patchwork of colour and chaos I struggle to keep up with everything. Harvest has begun. This year the fruit cage has yielded its best. The strawberries are finished, eaten hand to mouth. 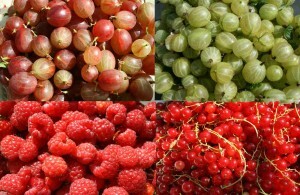 Huge bowls of raspberries have made their way to the deep freeze and I’m overwhelmed with red, white and black currants and huge gooseberries both red and green. Jams and jellies are in the larder and still more fruit must be picked. Recently I was given a wonderful opportunity to return to my culinary roots. I received an invitation from Tom Jaine, he of The Good Food Guide, Carved Angel in Dartmouth and The Hole in the Wall in Bath. He asked me to take part in the formation of new website called 1000 Cookbooks. I simply had to pick my ten favourite cookbooks explaining my choice. What a pleasure, what could be more fun. Of course I have no idea if I or my chosen books will be included in the final selection, but I had such a good time making my choice. I have a large collection of cookery books and they all came off the shelves as I pondered for days exploring forgotten tomes and returning again and again to my old favourites. My battered and broken Elisabeth David, the wonderful Jane Grigson and so on. For the last thirty three years I have lived and worked on a small farm in South Devon where I have had the opportunity to indulge my love of cooking and good food. Over the years we have kept sheep and Dexter cattle, produced Christmas turkeys and free range chickens and eggs. 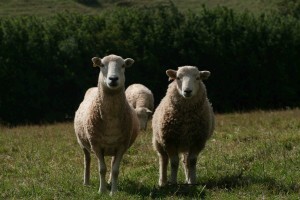 We still breed Whiteface Dartmoor sheep and grow all our own fruit and vegetables. I know the provenance of almost all we eat. I grew up in post war London and still remember my ration book. In the 1960’s I was sent to Constance Spry’s Winkfield Place Cordon Bleu Cookery School. I went reluctantly, I had other ideas. But thanks to Rosemary Hume my life- long passion for cooking started here. Next came Nick’s Diner in Fulham where I worked under the expert eye of Kem Bennet, late of George Perry Smith’s famous Hole in the Wall in Bath. My culinary journey had begun. For the last ten years I have kept an on line diary of Food and Farming. In a fast moving world I have watched eating habits change, old skills disappear and new ones take their place. 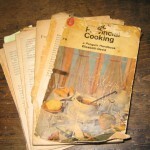 My old, browned, broken paperback copy of French Provincial Cooking is, without doubt, my favourite cookbook of all; my introduction to a new world of cooking and eating. Elisabeth David books were a breath of fresh air after the austerity of rationing and the depressing food of the post war years. In the mid ‘60’s the teenage me cooked at Nick’s Diner in Fulham under the expert eye of Kem Bennet, late of George Perry Smith’s famous Hole in the Wall in Bath. When I wasn’t learning to cook I was reading Elisabeth David. How perfect an introduction to the world of food! I have to put Rosemary Hume second because it was she who taught a very reluctant teenage student at Winkfield Place that cooking was a pleasure, an adventure, fun and not a chore. I still find myself returning to the pages of this old friend. I find Jane Grigson’s knowledge and style captivating. I have learnt not only about cooking fruit from this book but also a huge amount of history in general. For this reason I love all her books; so much more than just recipe books, they are a pleasure simply to sit and read with a glass of wine! In her introduction Paula Wolfert sums up for me why I love this practical , hands-on book and find myself returning to it time and time again: “The idea is that you too can possess the South-West not merely in words, but in that most tangible and sensuous necessity of people’s lives: the wonderful food they eat” : a truly delicious book! A classic, of course! Anthony Bourdain’s Introduction sums it up. I particularly like the notion that “ it would be disingenuous to the animal not to make the most of it” For several years I kept pigs and, with Fergus Henderson’s help, I have been lucky enough to learn from this wonderful book how to use absolutely all the deliciousness from nose to tail of the pork we produced! This is a book as much about the growing of food as the cooking of it. It is about the French countryside, delicious straight forward food and Amanda Hesser’s amusing relationship with the gardener, Monsieur Milbert. She must travel a long journey to persuade him to trust his beloved produce to the hands of a young cook from a foreign land. A gift from a friend, this book has become a textbook for me. Living in South Devon on a small farm over the years we have been producing not only our own fruit and vegetables but also our own meat: turkeys, free range chickens, Whiteface Dartmoor lamb and rare breed pork. Here is a book that talks about the provenance of food, of the livestock, the food producers as well as a wealth of in depth cookery information and terrific recipes. At last, a beautiful, informative exciting book about Japanese food in English! Nancy Singleton Hachisu left her native California twenty five years ago to travel to Japan to learn about the food. She never returned, instead she married a Japanese farmer, a man as passionate about food as herself. Here is the story of their life on a farm in northern Japan, a book about the wonder and demystification of Japanese food. Beautifully written and full of wonderful photographs this book has a special place in my heart: I have Japanese family and have been lucky enough to travel extensively in Japan and now, at last, Nancy Singleton Hachisu has made the food accessible to me as well! A list of my favourite cookbooks would not be complete without Alice Waters. Her influence on good food from Berkeley, California right across the USA and her support for the Slow Food Movement across the world is legendary. I count myself very fortunate to have had the opportunity to eat at Chez Panisse where they “try to interfere as little as possible with the transition of good and pure ingredients from their origins to the table…” a notion reflected so well in this book. All the books I have chosen live on my kitchen shelves and are well thumbed and oft used so I cannot imagine the list complete without Nigel Slater, one of my favourite food writers. I frequently find myself reaching for his Diaries, too tired to think after a particularly busy farming day. He never lets me down! We’ll that is my choice; we shall see if I am selected. 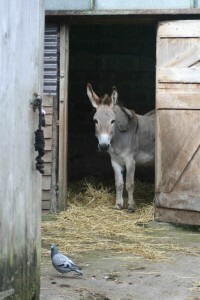 Meanwhile back to the donkeys to clean the stable and, of course, pick more fruit!